Immanuel Lutheran Church and School - How do I subscribe to a podcast? The link for our podcast is http://www.immanuelbatavia.org/sermonpodcast.php?siteid=2741. You will want to copy this link. Then, you'll want to open up iTunes. If you don't have iTunes, download it at www.apple.com/itunes. Newer Versions: Click on the "File" menu at the top, and choose "Subscribe to Podcast" from the drop-down menu. 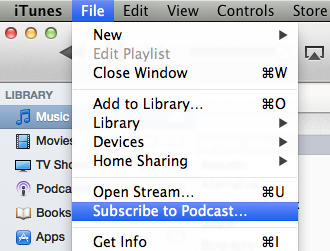 Older Versions: Click on the "Advanced" menu at the top, and choose "Subscribe to Podcast" from the drop-down menu. Paste in the podcast link you copied in step 1. Click the "OK" button. The most recent installment of the podcast will begin to download, and your podcasts will be housed under the "Podcast" library on the right. When new podcasts are published to the web, they will automatically be downloaded into your iTunes library so that you can listen to them on your computer or portable music player.